With Horse Whispers we set out to bring something new and different to the horse art world. Something you won't find anyplace else. 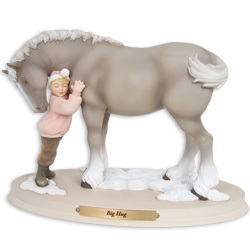 Something that touches the hearts of horse crazy girls and horse loving women everywhere in a unique way. 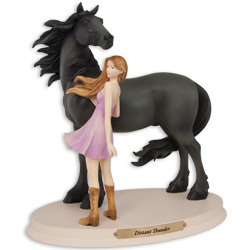 And that was to create an original series of horse-and-girl figurines with a beautiful idea behind them. 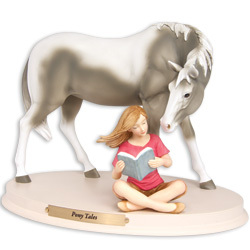 Horse figurines that captured and preserved a special moment in time shared by a girl with her horse. With this, our third release, we proudly add four more elegantly crafted horse figurines to the collection. 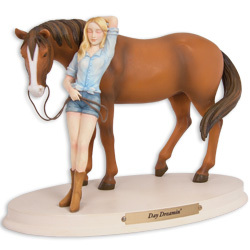 If you are unable to get out and experience the special connection that is possible with a horse, the next best thing is a Horse Whispers figurine. of playtime for this girl and her horse. a romp through the land of dreams. "Go find your own book, you pesky pony!" 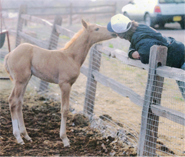 says this young girl as she ducks her horse's nuzzling. But does she really want him gone? Or is her secret smile saying, "I'm glad you're here. Let me read you a story. little girl at least once in its life.